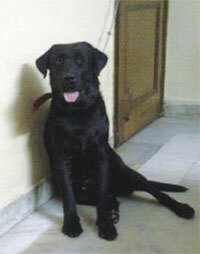 You are here: Home / Paw Tales / Nawab – the light of our life! I still remember the day my little black bundle of love and joy entered my life. Nawab was a four months old Labrador pup, and the moment I visited him for the first time, he came running to me wagging his tail. At that moment, I knew I was in love and that I had to take him home with me that very moment. Nawab was probably not taken care of at his first home and had fleas, dandruff and itchy skin but despite all odds, he was an instant hit in my house… my husband, son and my helpers all fell in love with him. 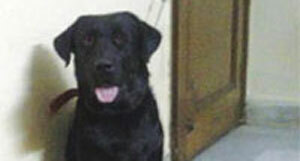 In just a few months, Nawab’s coat was shining and glossy and he was turning out to be a handsome young man. Our house resounded with his playing, running and his antics. It was such a sight to see him entertaining and showering us with his love and affection. For his walks, we bought him a nice red collar with bells, a cute red jacket and he looked like little red riding hood in it. He just enjoyed his walks and hated coming back home. He loved to sniff, investigate every pole, nook and corner and pee on every car tyre in sight. In just a matter of days, he became the love of everyone, young and old, in the park, playing with them jumping, barking, and chasing everything in sight. There’s never a dull moment in our life…he is full MTV unlimited for us. He hides under the table where no one can reach him, when he does something wrong. When he wants attention, he brushes himself against us. Sometimes, he just picks up a rag and stands in front of us, as if saying- ‘Hold the end and let’s play tug of war.’ He loves to be tickled in the stomach with his legs up. The latest craze in his life is plastic bottles; he has to have one daily and will not rest until and unless he has flattened it. A very loving loyal friend; he is like a baby for us. The look he gives us in the morning when he waits for someone to take him for a walk is touching. He knows when to approach us with a sad mournful face and when to jump around and wag his tail, and knows whom to go to get his work done. He is very expressive and naughty…our true bundle of joy. Sometimes I wonder that our life would have been so dull, boring and monotonous without a pet and I thank God for sending Nawab my way. Believe me a pet can change your outlook of life… I have a real example in my life … my husband who was never too fond of dogs is so attached with Nawab today that without him he would be lost…I am glad I got the chance to teach my husband and people around me to love animals and make them a part of our lives. http://www.dogsandpupsmagazine.com/wp-content/uploads/2011/03/Nawab-–-the-light-of-our-life-2.jpg 161 300 Dogs and pups Magazine http://www.dogsandpupsmagazine.com/wp-content/uploads/2017/05/1254nal.jpg Dogs and pups Magazine2011-03-22 09:40:552013-09-06 15:23:16Nawab – the light of our life!